Thank you to the group who turned out today (20th December) to clear in and around the pond on the Wash Brook Nature Park and to Pete and Vicky, the environmental rangers from the City Council, for leading the session. The management plan includes clearing one third of the pond each year, and some of us spent our time wading around in the pond, digging out sedges that had spread through the pond and threaten to clog it up. We also removed bricks, wood, cans, bottles and a sheet of plywood. We used the bricks to create an area where newts will be able to hibernate away from the pond. Others worked around the edges of the pond, cutting back blackthorn and brambles that are encroaching on the pond, and which contribute to drying it out in the summer, and cutting back the yellow flags that spread everywhere. We left purple loosestrife and soft rush where we could. We also measured the water quality in the pond for nitrates and phosphates, and the levels of both were negligible. Photo of the pond when we arrived. Apart from one area of clear water, much of it is full of sedge, and scrub is encroaching at the back. 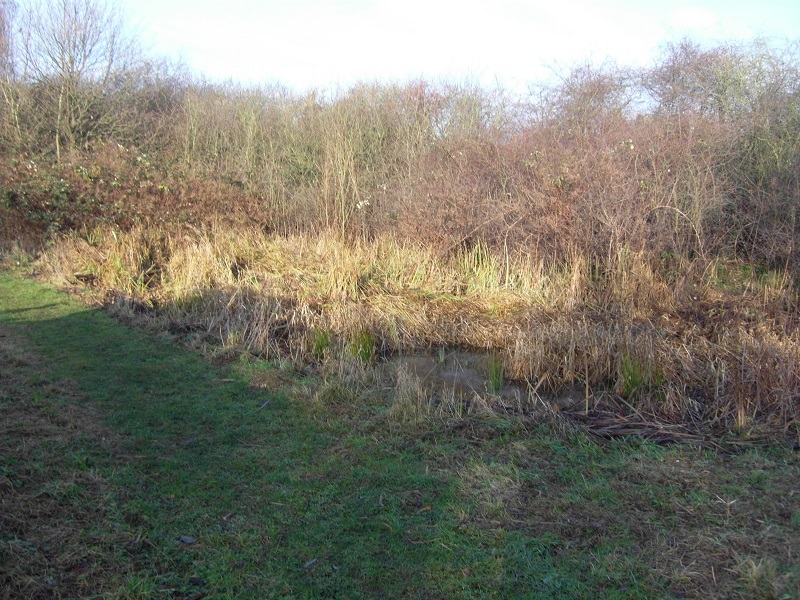 There will be a further session on Thursday 18th January 2018 from 10.00 am to 12.30 pm, when we shall take the small willow out of the pond, cut back more bramble round the north end of the pond and clear more sedge from the pond. If you are interested in taking part, you must register with the Parks Department’s Leicester Environmental Volunteers scheme for insurance purposes and sign up for the Shared Waters Puddle Ducks event on 18th January by emailing lev@leicester.gov.uk at least five days before the event. There are more details about the Leicester Environmental Volunteers scheme on the council website.